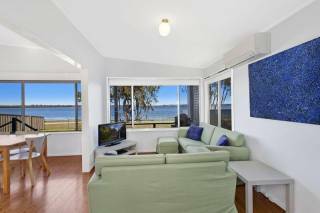 Casa Bianca on the lake is a comfortable, well equipped 3 bedroom air conditioned waterfront reserve cottage resting on a very quiet part of glorious Lake Macquarie. 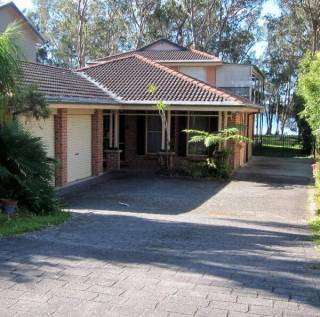 The home is beautifully situated for you to take advantage of the long lake sunsets and afternoons by the water in the shade of the majestic gum trees. A feature of the cottage is the large undercover deck with outdoor setting where you can relax and enjoy the lake views in the cool breeze or you may dine on the fish you have just caught and cooked on the outdoor BBQ. The property has a large gently sloping lawn down to the lakes edge that has easy water access for boating and other water sports. 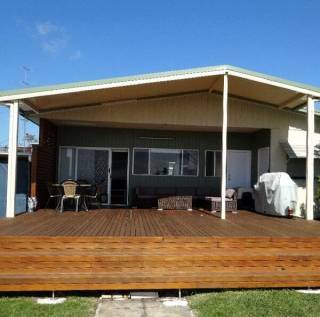 There is a small boat ramp just 50m from the cottage or you can use the main boat ramp with large jetty, fenced sea pool, and BBQ facilities just 3 minutes drive away. The split level house with spacious cathedral ceilings sleeps up to seven people (recommended for 6 adults). The master bedroom has a queen bed with a large built in wardrobe. While the second bedroom has a tri bunk (a single bunk over a double bed) and a small desk. The third bedroom has a single bed and a slide out trundle bed that may also be moved into any other room if required. The upstairs area also has a separate toilet and bathroom with large bath and seperate shower. The downstairs consists of an open plan living area with comfortable lounges to relax after a day enjoying the water. The kitchen is well equipped with plenty of appliances and cookware and combined with a large Kleenmaid gas cook top with double oven, you will be able to cook up a storm. There is a dining area next to the kitchen for easy meals. The 2nd bathroom has a shower and a toilet, the laundry has washing, drying and ironing facilities. Stunning Lake Macquarie is Australia's largest inland salt water lake; we are nestled on the serene southern shores of the lake, at the northern end of the NSW Central Coast. From Casa Bianca Lake House you can take advantage of many activities including, sailing, water skiing, wake boarding, canoeing, and fishing. It is the perfect location to relax with the family, or just getaway for a romantic weekend. We provide a small "tinny" row boat for you to paddle around the lake and a 3 seater Canadian canoe. We provide life jackets as well as an anchor, oars and paddles. Or you can bring your own boat and tie off in front of the cottage! Casa Bianca is only 5 minutes stroll to the local shops which include two takeaways, coffee shop, post office, chemist, newsagent, bottle shop and a well stocked general store with bait and fuel. Acceptance of pets is entirely at the discretion of the owners and will be assessed for each booking. 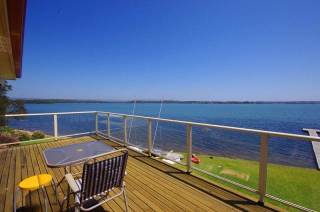 ****We have had the pleasure of staying at Casa Bianca at Lake Macquarie twice now. The house is waterfront with a big back lawn for kids to play on or just laze around on. The view from the back veranda is picture perfect and the tranquillity can?t help but seep into your body when you look out onto the lake. You well and truly know you?ve left the City behind. The boys loved the canoe and surf ski, which was a welcome change to seeing them with their heads in their electronic gadgets. The house is very well equipped with board games, books and DVDs. In fact everything you need to spend time together. I found that Casa Bianca is better equipped in the kitchen department than most holiday houses with lots of cutlery, crockery, cook and glassware, so you can actually cook a meal just like at home. Another bonus is the helpfulness of the hosts. They know the area well and are very generous with their advice on where to shop, what to see and where to eat. An aluminium rowboat, Canadian canoe and plenty of sports equipment for the energetic! In the cottage you can check out the selection of books, magazines & board games or sit outside and check out the resident wildlife! Golf course at Morriset (10 minute drive) another course at Kooindah Waters or Toukley Golf course. Central Coast attractions - tourist information brochures are provided for you to browse. The eastern side of Lake Macquarie borders the Pacific Ocean. The water is crystal clear and the sand is golden making the beaches a hotspot for surfers and swimmers alike. You can surf great waves in the heritage listed township of Catherine Hill Bay, have a day out with the kids at Caves Beach or Blacksmiths Beach where there are kids activity areas, BBQ facilities and a protected rock pool, or walk the expanse of Nine Mile Beach which has a patrolled beach at either end. Number of Guests should not exceed the numbeer as per the booking or subsequently agreed in writing or email. Fees will apply for excess guests not agreed with the owners in advance. Linen and bedding is supplied but our guests are required to provide their own bath and beach towels. Guests use the dinghy and canoe at their own risk. Lifejackets are provided for use with the boats. Departure - the property should be left in a similar state to its condition on arrival. Check-out time is 11:00 at the latest, to allow time to prepare property for next guests. Bond is payable at the same time as the balance amount. The bond will be refunded within 7 days (of your departure)in full subject to the above conditions being met. It is designed to cover any additional costs incurred including but not limited to, any breakage, damage or excess cleaning requirements (including garbage sorting due to garbage being placed incorrectly), extra guests beyond those declared ..etc. Tents or fires are not permitted on the property or on the reserve. Cancellation Policy: Fee of $90 applies to cancelled bookings. Up to 14 days prior to arrival 100% of total price (please call to discuss your circumstances). 21 days prior to arrival date 100% of total price (please call to discuss your circumstances). These cancellation fees will be waved if accommodation is rebooked by another party or you choose to rebook for another date within the following 3 month period.